Green Energy: Jobs Engine or Money Pit? The United States does not have a carbon tax, a cap and trade system, or a national renewable energy standard. As a result, our "green energy policy," to the extent that one exists, is a matter of picking winners (and, implicitly, losers) with government money, for example by giving companies a tax break if they are developing solar technology. The problem with the government picking winners and losers is that sometimes the government-picked winners turn out to be losers. Subsidized companies fail and they take taxpayer dollars down with them. Take this solar cell manufacturer that closed its Massachusetts shop, laid off 800 workers, and moved to China, where work is cheaper and the subsidies are better. As he tells this story, Edward Glaesar writes in the New York Times that the green energy economy won't be a job creator. Now, one company doesn't make a trend. * If I wanted to write the opposite story, that U.S. investments in green energy will produce jobs, I could tell you about Suniva, a manufacturer of high-efficiency solar cells operating out of Georgia. You want to talk government-backed innovation? The company grew out of the Department of Energy-funded project at the Georgia Institute of Technology. You want to talk export-driven industries? In 2010 Suniva received the Green Transaction of the Year award from the U.S Export-Import Bank after a $2 million financing deal with India. You want to talk job-creation? The company doubled in size to 130 employees between 2009 and 2010. In the end, we don't know if a green energy industry will create hundreds of thousand of jobs, not only because we cannot see the future, but also because our green energy industry is fledgling, nudged by short-term subsidies, tax credits, and financing deals. Rather than embrace a national green policy by pricing the risk of fossil fuels to make clean energy competitive, we've relied on cash gifts. And it's not even that much cash! China out-invests the United States in solar, renewables and other green tech, partly beacuse the United States doesn't put most of its R&D into green tech. 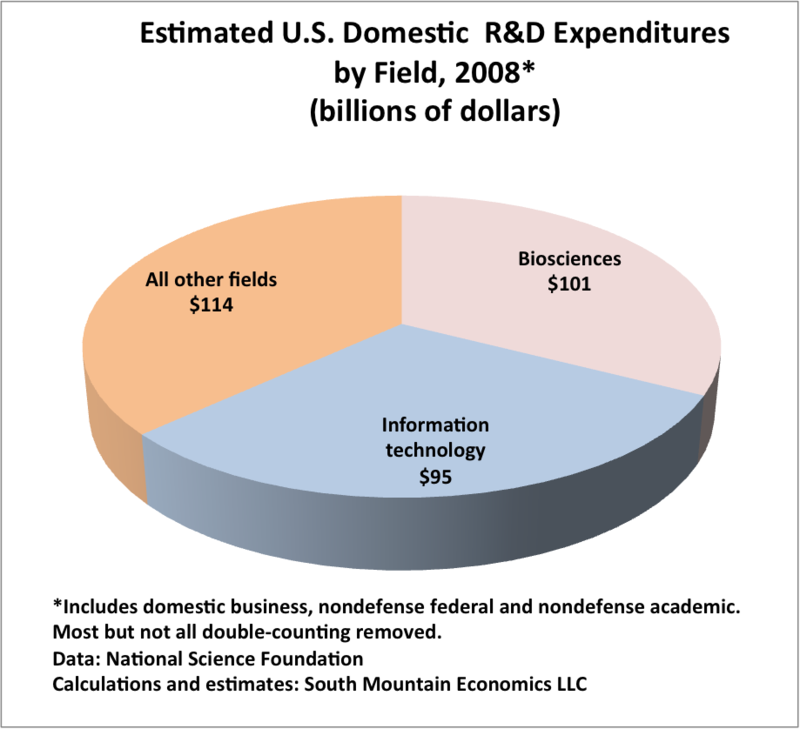 While China pads its lead in solar, the U.S. invests in biosciences and information technology. "The truth of the matter is the U.S. in the last 10 years has put its R&D money into information technology and biosciences, not energy" economist Michael Mandel told me. "That's really it. We have no investment in green energy R&D, we have no dynamism there. When your local university invests 70 percent in life sciences and 2 percent in energy, why put your bet on energy?" Both countries might be making the right bets. Smart cheap clean technology from China could lower our energy bills and reduce our need for expensive oil, while breakthroughs in infotech and medicine could enrich U.S. companies through licensing and exports. *Also, I'm struck by Glaesar's suggestion that green jobs couldn't produce opportunities for low-skilled, low-wage workers. A green economy isn't all white coats and engineers. It's also caulkers, and grass roof installers, and turbine repairmen, and as cheap as China's labor is, you're not going to call Shenzen for home repair.